Even though summer is nowhere near, you still find yourself craving sunshine, a warm breeze, soft sand and the summer dessert of choice: s’mores. While I don’t suggest stoking a fire when it’s below 10 degrees outside I can help you give into your s’mores craving. 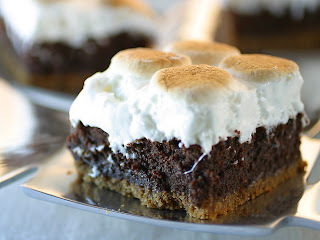 However, since we are already not using a traditional camp fire method, lets amp up these s’mores and add brownies to the equation. Take a 13 x 9 baking pan and spray the bottom with non-stick cooking spray. Then take your graham crackers and line the bottom of the pan with them. Mix up your brownie batter in a separate bowl. Poor the brownie batter evenly over the graham cracker bottom. Bake the brownies and graham crackers for 25-28 minutes. Check to see if done by sticking a toothpick in the center of the brownies. The toothpick should come out clean. When almost done, take them out and pour your bag of mini marshmallows over the entire tray of brownies. Turn the broiler on and stick your brownies back in. Make sure to watch them and do not walk away because the marshmallows will melt quickly. When the marshmallows look fluffy and golden, it is done. Let the s’mores brownies cool all the way before cutting. Instead of using a knife try using a pizza cutter to cut through them evenly.